Ripple rock. 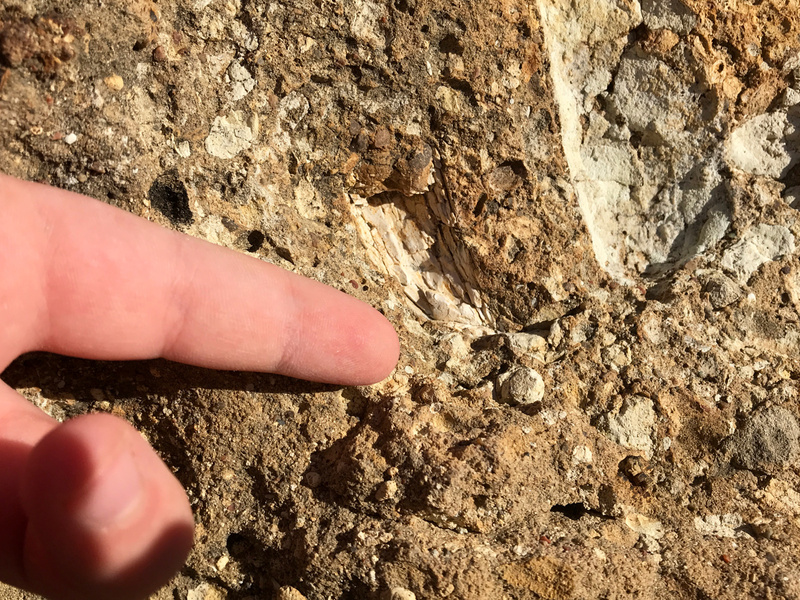 Not from the Morrison, but from the overlying Dakota – Lower Cretaceous. Now this is from the Morrison. 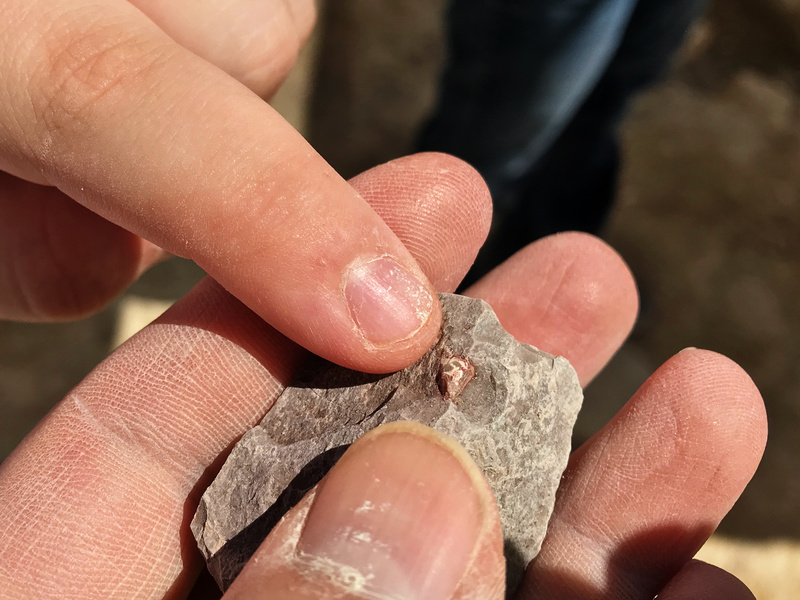 My son, London, spotted this tiny tooth of a Jurassic croc while working in the quarry. That’s my thumb and London’s index finger for scale. London’s index finger again, pointing at a different Morrison tooth. 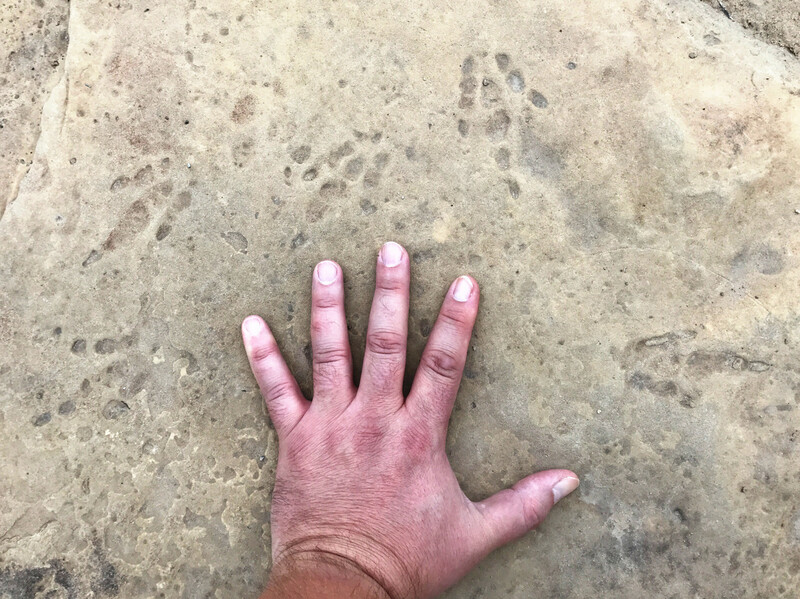 This one’s from a theropod, still exposed in a sandstone block in one of Stovall’s old quarries from the 1930s. On a completely different hillside, I spotted this skull, of a modern rodent. Vole, maybe? Not my bailiwick, but if you know who this belongs to, let me know in the comments. 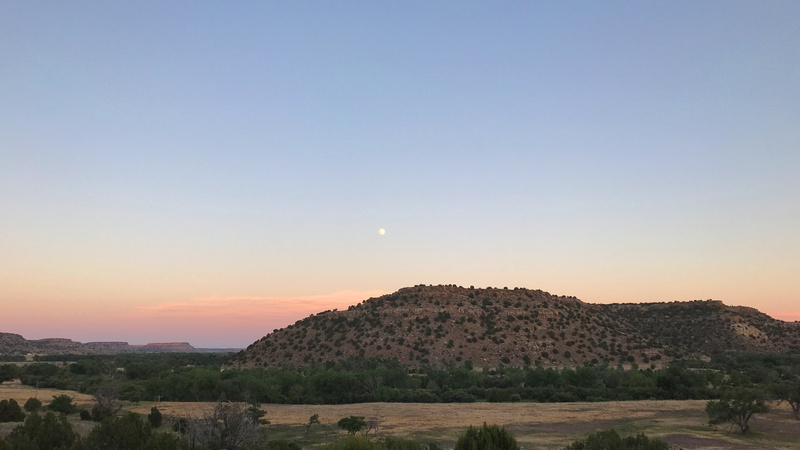 Moonrise – and the end of this post. Catch you in the future. 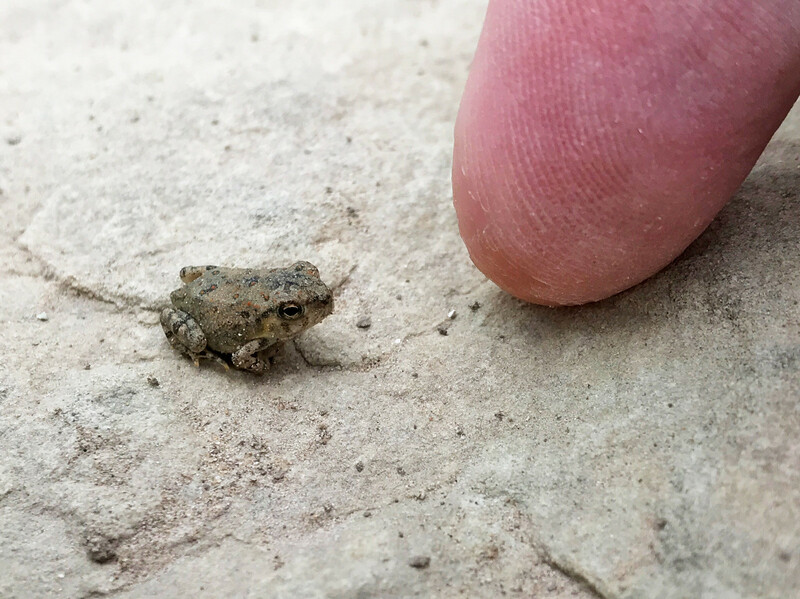 Baby spadefoot toad, with my index finger for scale. Someone was here before us. 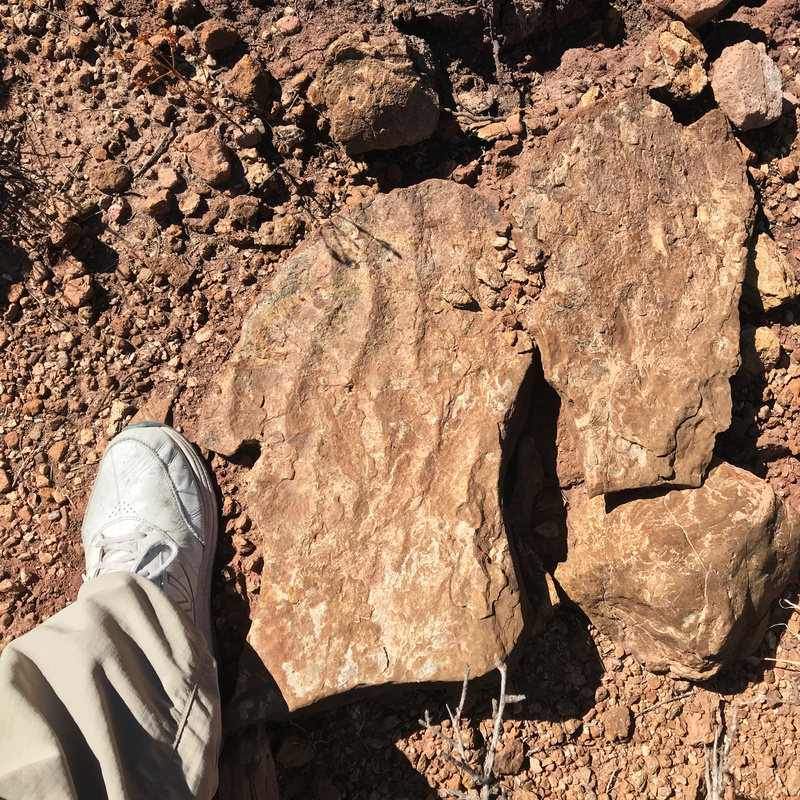 Even though Black Mesa is best known for its Morrison exposures and giant Jurassic dinosaurs, there are Triassic rocks here, too, which have produced both body fossils and tracks, including these. Now if you’ll excuse me, I have to go watch a thunderstorm. Did apatosaurs have unusually large neural spines, too? 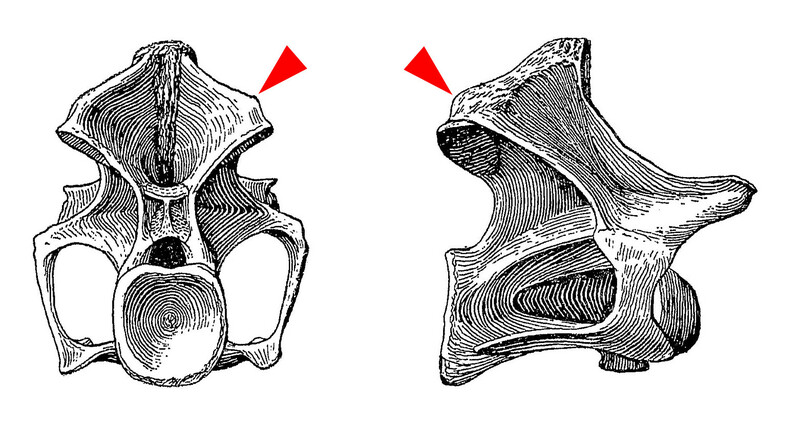 We all know that apatosaurines have big honkin’ cervical ribs (well, most of us know that). But did they also have unusually large neural spines? Why was I thinking about C10, particularly? 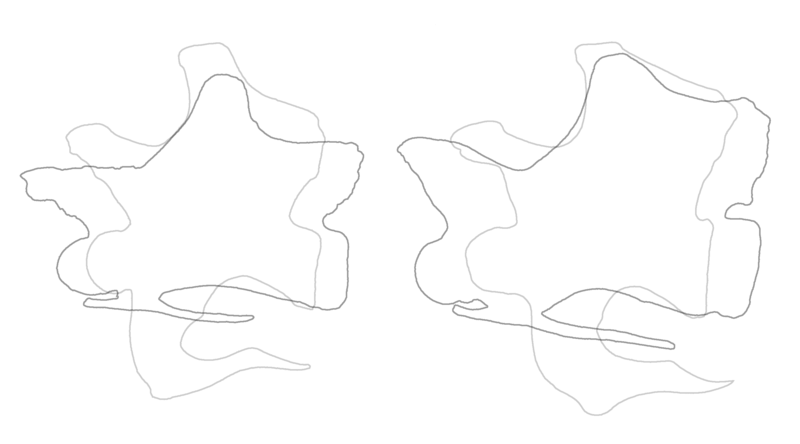 I traced and also stacked Gilmore’s (1936) drawing for my 2002 paper with Kent Sanders, and recycled the trace for my 2007 prosauropod paper, and recycled the stack-o-C10s for my 2013 PeerJ paper with Mike. So for better or worse C10 is my mental shorthand for A. louisae, the same way that their respective C8s seem to capture the essence of Giraffatitan and Sauroposeidon. The A. louisae verts are a hair taller, proportionally, than those of D. carnegii, but not by much. 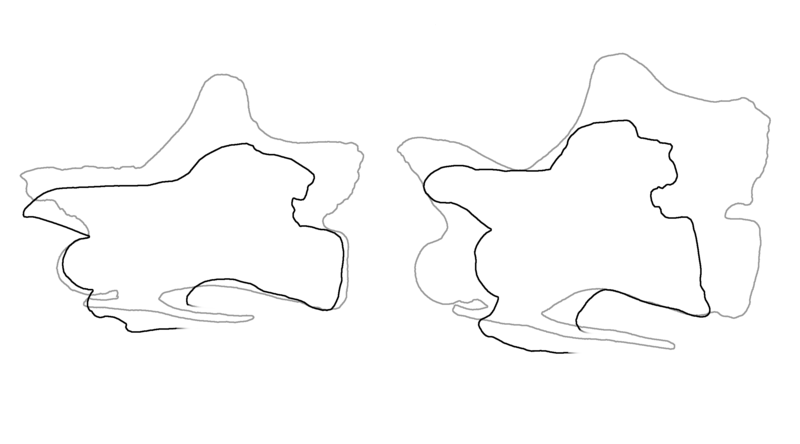 The difference is trivial compared to the differences in centrum length and cervical rib size. I deliberately picked the longest C9 in the AMNH collection, and the least-distorted C10. The first surprise for me was how well this C. supremus C9 hangs with D. carnegii in terms of proportions. That is one looooong Cam vert. In any other sauropod, it would probably be beautiful. 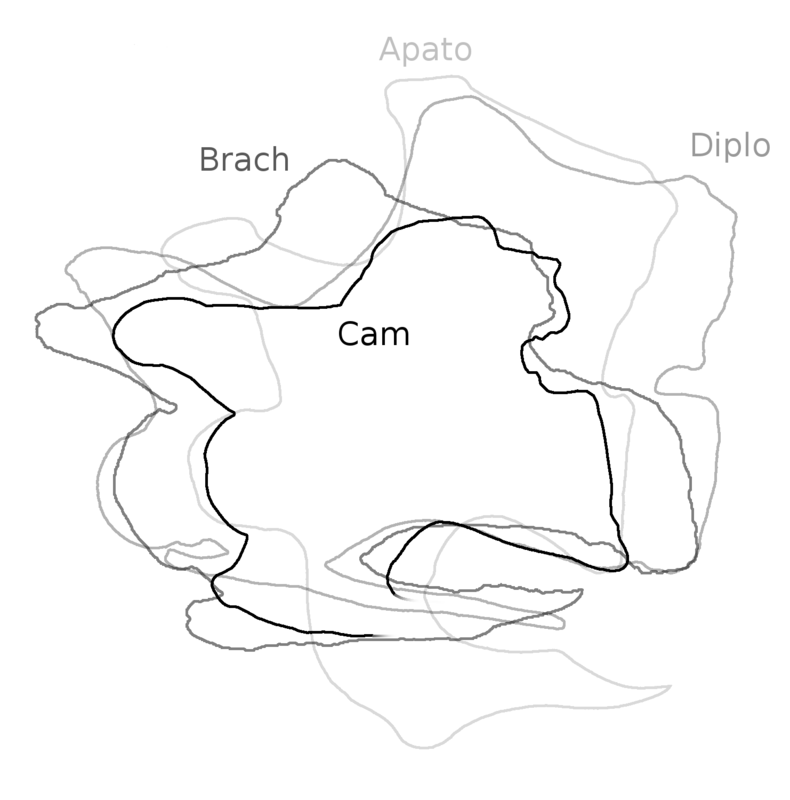 But because it’s Camarasaurus it attained its length in the most lumpen possible way, with the diapophysis way up front, the neural spine apex way at the back, and in the middle just…more vertebra. Like a stretch limo made from a Ford Pinto, or Mike’s horrifying BOBA-horse. The diplodocids don’t just have taller neural spines, their pre- and postzygapophyses are also higher than in the macronarians. That’s gotta mean something, right? All else being equal, putting the zygs farther from the intervertebral joints would reduce the flexibility of the neck. Maybe diplodocoids could get away with it because they had more cervicals, or maybe their necks were stiffened for some reason. The zygs being set forward of their respective centrum ends in the macronarians really comes through here. This emphasizes the outlier status of Apatosaurus in the cervical rib department. It bears repeating: the cervical ribs of Camarasaurus are certainly wide, but they’re not nearly as massive or ventrally expanded as in apatosaurines. So far, pretty interesting. I’d like to add Barosaurus and Haplocanthosaurus to round out the “big six” Morrison sauropods. I known Haplo has big, tall, almost apatosaurine neural spines (as shown above, with arrows highlighting the epipophyses), but for Baro I’d have to actually do the comparison to see where it falls out. The idea of bringing in Barosaurus also forces the question, previously glossed over, of how legit it is to compare C10s of all these animals when their cervical counts differed. 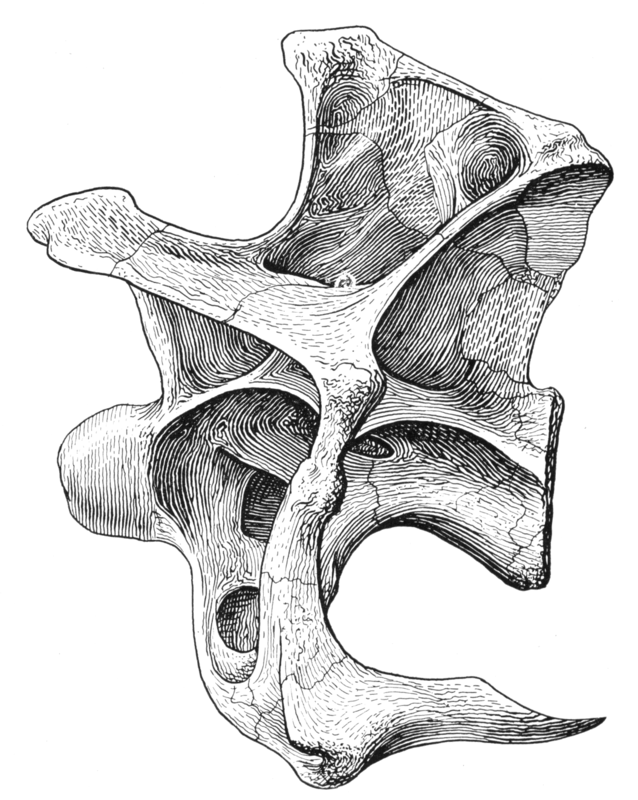 C. supremus is thought to have had 12 vertebrae in its neck, Brachiosaurus 13 (based on Giraffatitan), A. louisae and D. carnegii 15, and Barosaurus probably 16. It would be more informative to graph neural spine height divided by cotyle diameter along the column for all of these critters, plus Kaatedocus and Galeamopus. But that’s a lot of actual work, and as much fun as it sounds (really, I’d rather be doing that), I have summer teaching to prep for and field gear to wrangle. So I’ll have to revisit this stuff another time. Gilmore Charles W. 1936. Osteology of Apatosaurus, with special reference to specimens in the Carnegie Museum. Memoirs of the Carnegie Museum 11:175–300 and plates XXI–XXXIV. Hatcher, John Bell. 1901. Diplodocus (Marsh): its osteology, taxonomy, and probable habits, with a restoration of the skeleton. Memoirs of the Carnegie Museum 1:1-63. Wedel, M.J., and Sanders, R.K. 2002. Osteological correlates of cervical musculature in Aves and Sauropoda (Dinosauria: Saurischia), with comments on the cervical ribs of Apatosaurus. PaleoBios 22(3):1-6. Wedel, M.J., Cifelli, R.L., and Sanders, R.K. 2000b. Osteology, paleobiology, and relationships of the sauropod dinosaurSauroposeidon. Acta Palaeontologica Polonica 45(4): 343-388. I’ve known who Peter Doson was since I was nine years old. A copy of The Dinosaurs by William Stout and William Service, with scientific content by Peter, showed up at my local Waldenbooks around the same time as the New Dinosaur Dictionary – much more on The Dinosaurs another time. Then when I started doing research as an undergrad at the University of Oklahoma, Peter’s chapter on sauropod paleobiology in The Dinosauria (Dodson 1990) was one of the first things I read. At the SVP banquet in 2000, I ran into Peter and he shook my hand and said, “Sauroposeidon rocks!” I managed not to swoon – barely. When I was in Philadelphia this March, Peter invited me to the UPenn vet school for an afternoon. 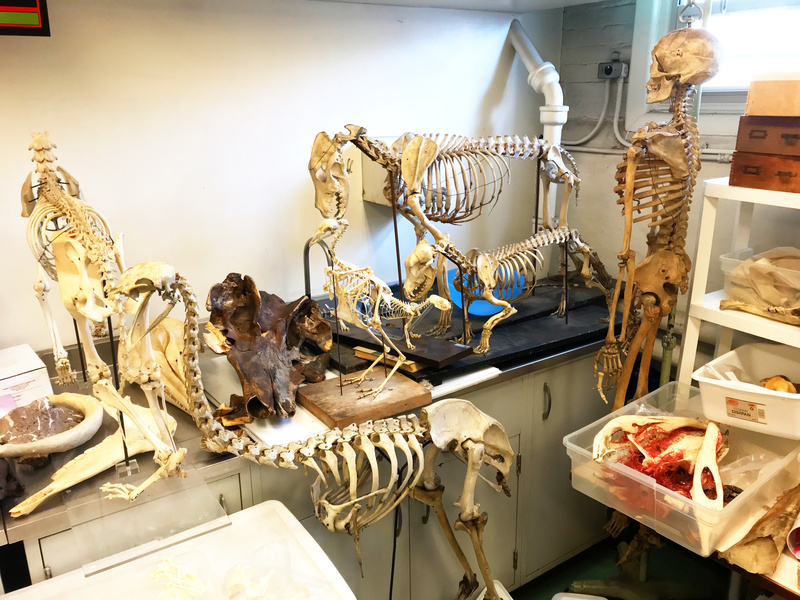 He gave me a tour of the building with its beautiful lecture halls and veterinary dissection lab, and then we spent a couple of hours rummaging around in his office. 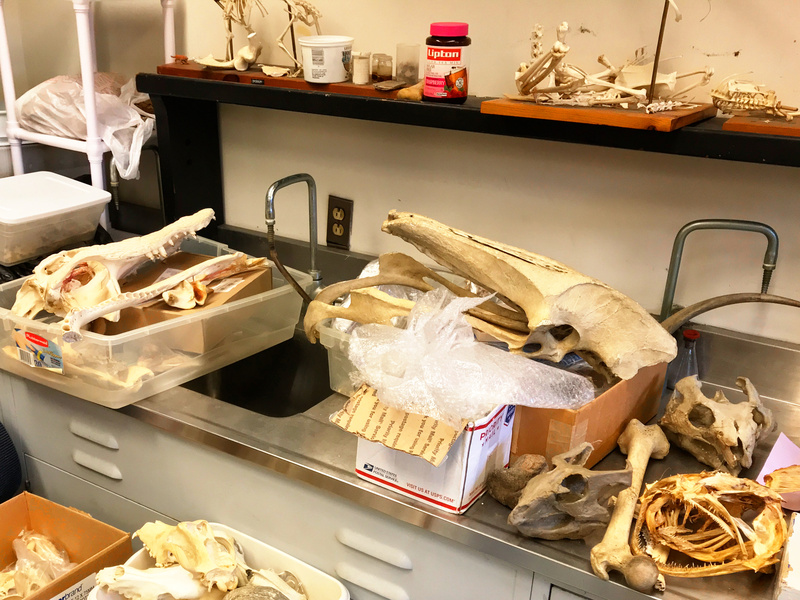 That was one of the highlights of the trip, because it turns out that Peter and I are both comparative anatomy junkies. He’s been at it for longer, and he has more regular access to dead critters and more space to display them, so his collection puts mine to shame. But he kindly let me play with study whatever I wanted. In fact, he went farther than that: he quizzed me. A lot. I take it that it’s a right of passage for people coming through Peter’s office. It was an enjoyable challenge, and I got photos of a few quiz items so you can play, too. This transversely-sectioned skull was one of the first mystery specimens. I figured it out pretty quickly, for reasons I’ll reveal in a future post. Can you? Post your IDs in the comments. I don’t remember all of the quiz items. 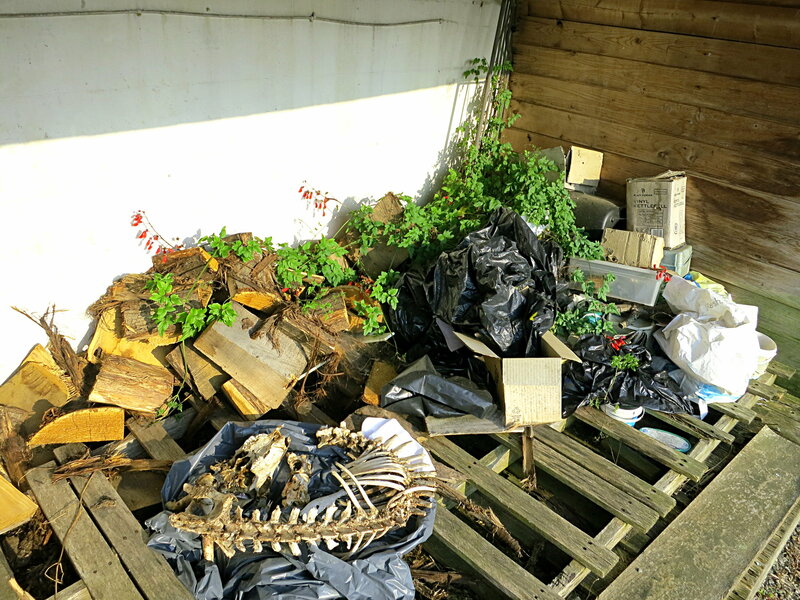 One of them was the dark skull lying upside down behind the ratite skeleton in the photo up top. I had to figure that one out without picking it up, so you have about as much information as I did. We’ll call that one quiz item #2. Embiggenate for all the clues you’ll need. This wasn’t a quiz item, just something cool: the skull of a large dog with the top of the cranium removed. In the paired cavities at the top, we’re looking down through the frontal sinuses to see the respiratory turbinates in the nasal cavities. The single large space behind is the braincase. 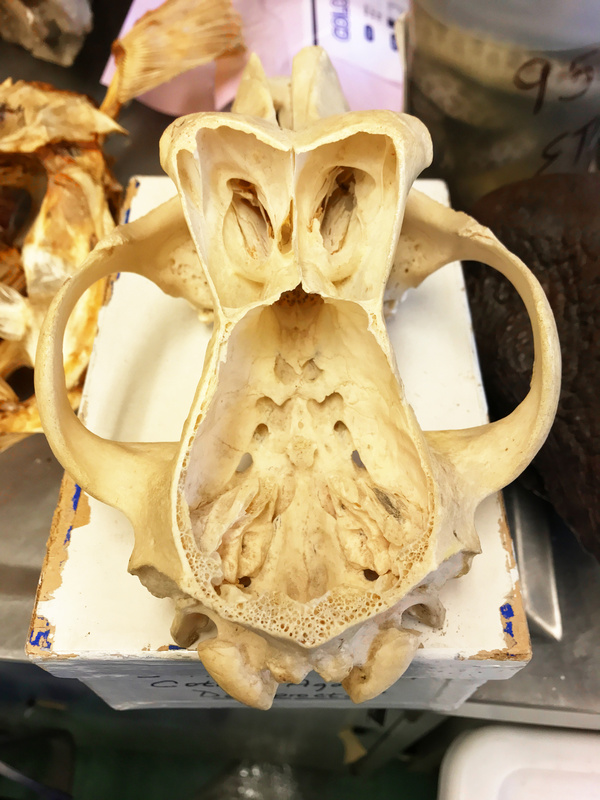 At the very front, in the shadowed recess, you can see the cribriform plate of the ethmoid bone, perforated with dozens of holes to let the olfactory nerve endings through from the back of the nasal cavities. We have the same thing on a smaller scale a centimeter or two behind our brows, and oriented horizontally. 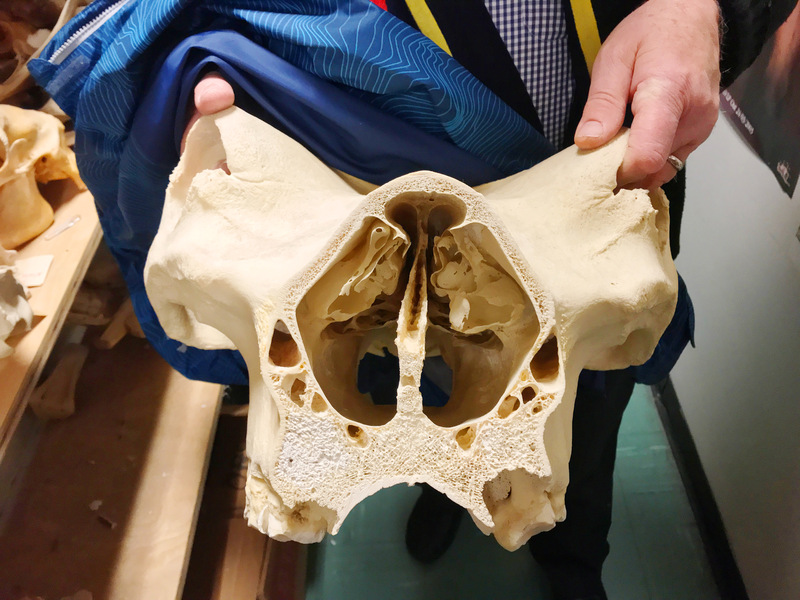 But what really drew my attention were the linear arrays of paired foramina arcing across the floor of the braincase – holes to let cranial nerves and the internal jugular veins out of the skull, and the internal carotid arteries in. 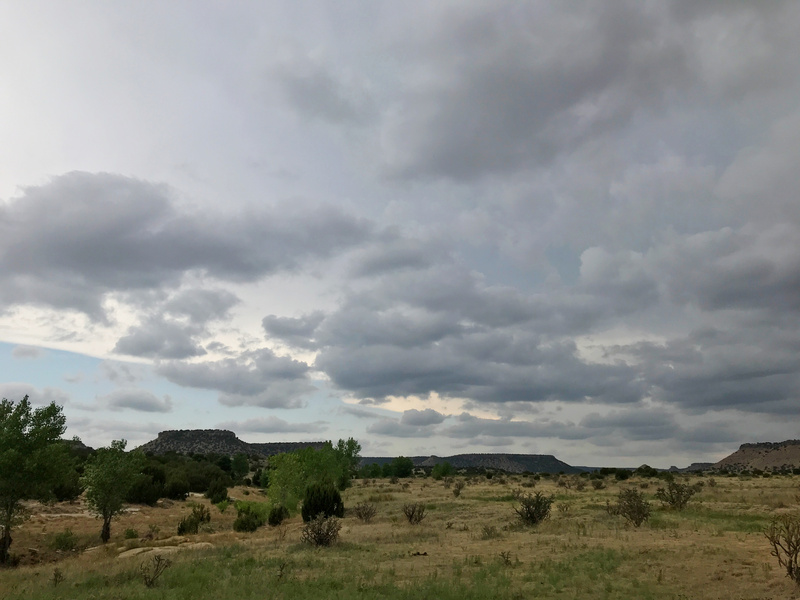 We have the same structures in our heads, of course, but the layout isn’t as neat – our big brains, bent forward at such a sharp angle from the spinal cord, have squished things around a bit. Here are more skulls, garnished with a human femur and a ratite pelvis and synsacrum. Peter quizzed me on the Archaeoceratops (front) and Auroraceratops (back) skulls on the far right. I IDed them correctly, but only because I spent some quality time with the Alf Museum’s casts when I was reconstructing the skull of Aquilops. On the far left is an alligator skull with injected arteries, which is definitely worth a closer look. 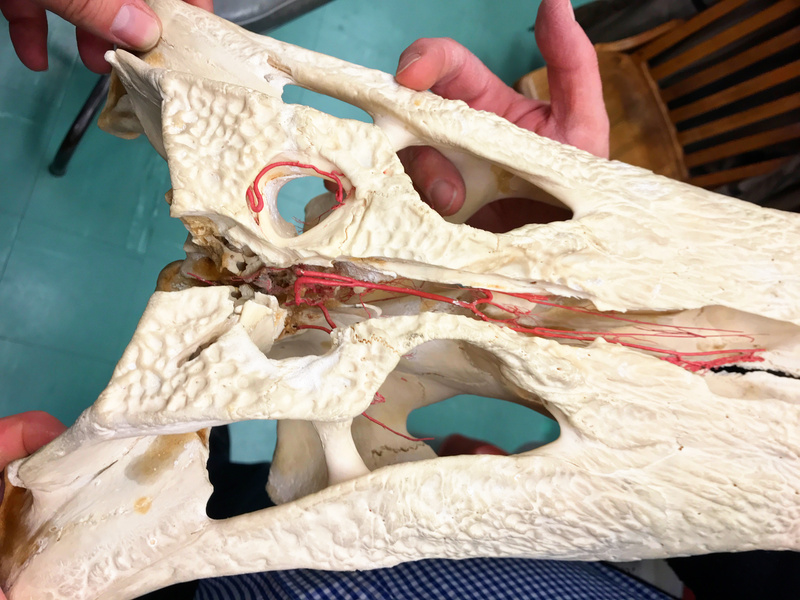 Here’s a dorsal view of the injected alligator skull. The arteries have been injected with red resin, and then all of the soft tissue has been macerated away, leaving just the bone and the internal cast of the arterial tree. Some of the midline bone has been removed here to reveal the courses of the cerebral, ethmoid, and nasal arteries. Also note the artery looping around in the left supratemporal fenestra. 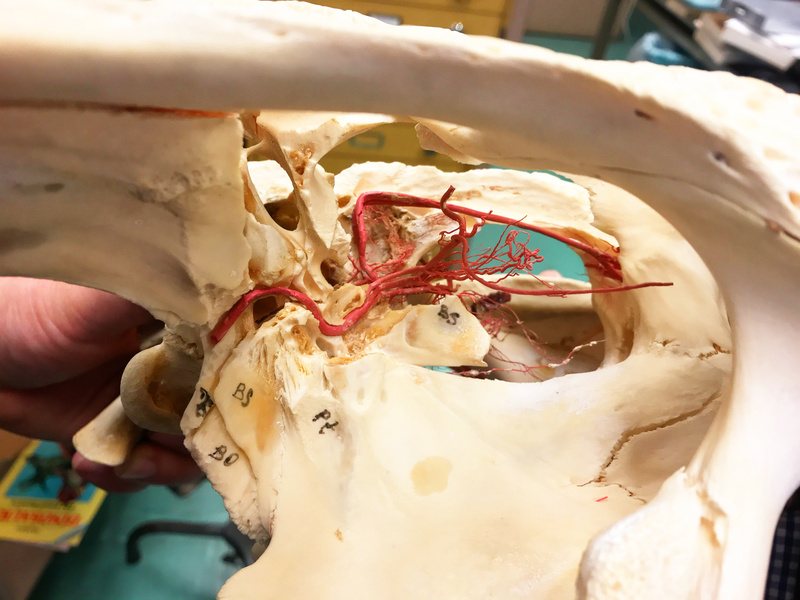 Here’s a look into the right side of the back of the skull, where the lateral wall of the braincase has been Dremeled away to show the course of the internal carotid artery. It’s a very cool demonstration of a bit of anatomy that I had never seen before. For more on cranial blood vessels in crocs, check out the obscenely well-illustrated recent paper by Porter et al. (2016). I didn’t get all of Peter’s quiz questions correct. 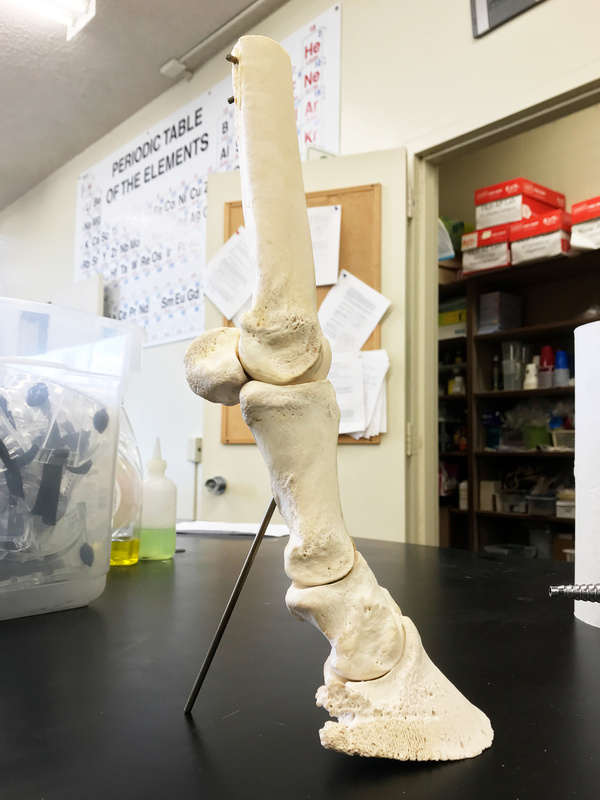 I knew that the endocast of the pharyngeal pouch in a horse was an endocast, but of what I didn’t know, although I did correctly identify the hyoid apparatus of a horse, mounted separately. 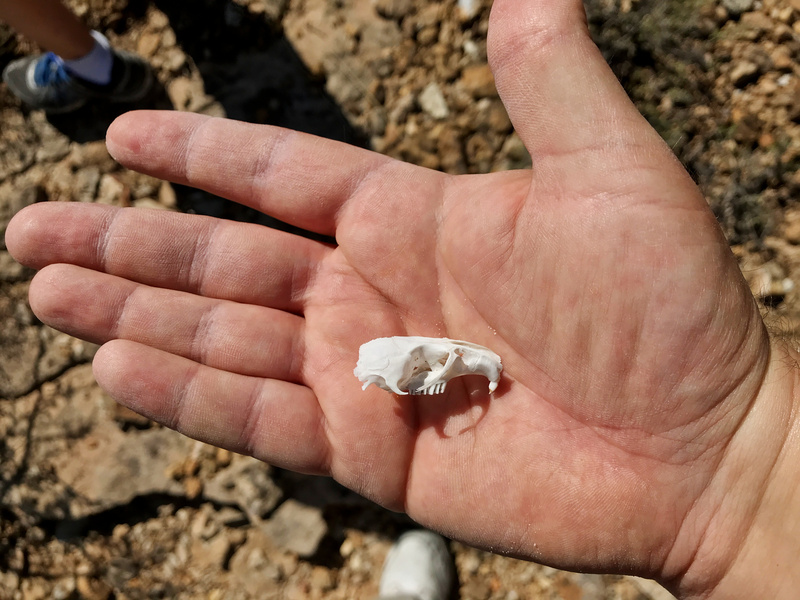 And there was a partial cetacean jaw that I misidentified as a shark (in my defense, it was from one of the small, short-faced weirdos). Still, Peter said that I’d done as well as anyone else ever had. That was nice to hear, but I was already happy to have gotten to see and talk about so many cool things with a fellow connoisseur. Thanks, Peter, for a wonderful afternoon, and for permission to post these pictures. I am looking forward to a rematch! Dodson, P. 1990. Sauropod paleoecology. In: D.B. Weishampel, P. Dodson, P., & H. Osmolska, (eds), The Dinosauria, 402-407. University of California Press, Berkeley. Porter, W.R., Sedlmayr, J.C. and Witmer, L.M., 2016. Vascular patterns in the heads of crocodilians: blood vessels and sites of thermal exchange. Journal of Anatomy 229(6): 800-824. Stout, W., Service, W., and Preiss, B. 1984. The Dinosaurs: A Fantastic View of a Lost Era. Bantam Dell Publishing Group, 160pp. Most of the specimens are hidden from view, apart from a tortoise that you can make out in a translucent box over on the right. The centrepiece here is some kind of medium-sized mammal, consisting of the skull and much of the vertebral column and ribs, which my youngest son brought back from a camping trip for me. Elsewhere in various boxes and bags are multiple kestrels, a falcon, several other birds, a couple of bearded dragons, a snake, a mole, a rat, and miscellaneous small mammals. Some day, I will prep out all their skeletons. I really will. Exploded turtle skulls are cool, but what about exploding the entire turtle? (Not that way.) 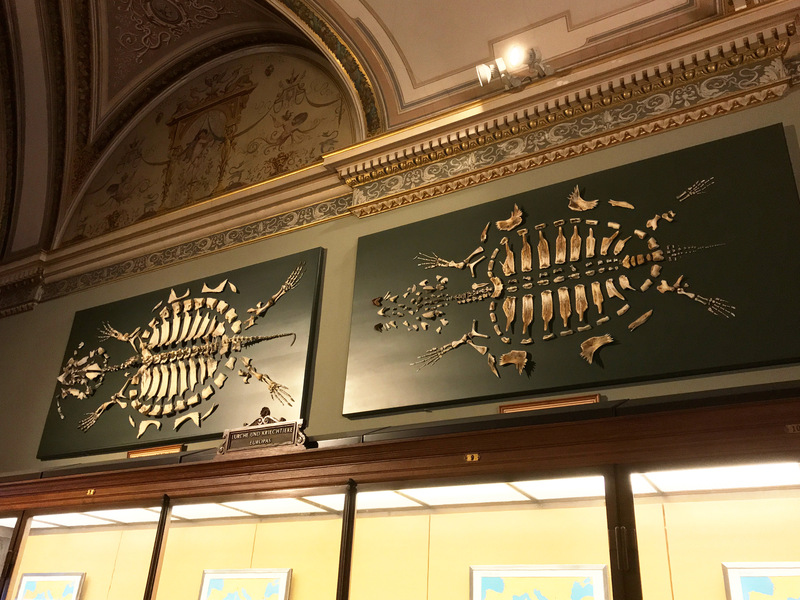 Folks at the Naturhistorisches Museum Wien roll hard. Or did – I assume these exhibits are old. 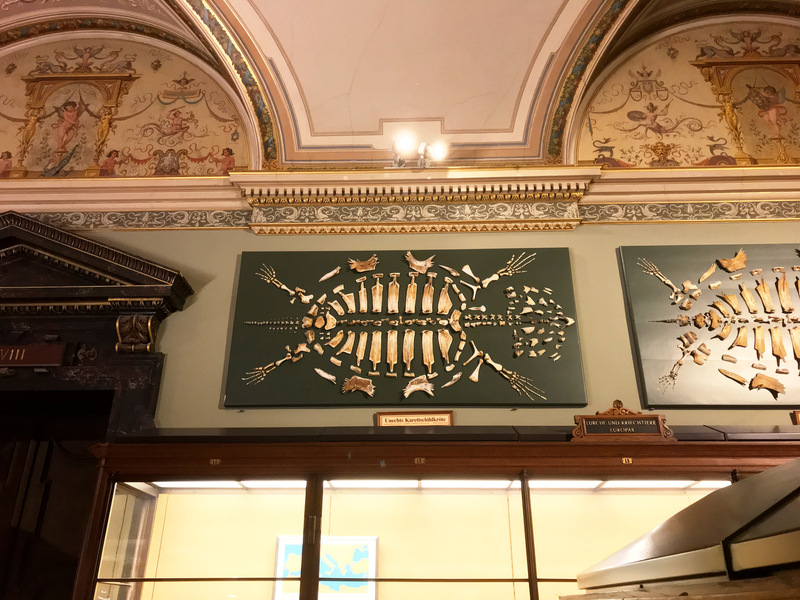 Thankfully no museum studies doofus has insisted they be taken down and replaced with an interactive 3D display on what it feels like to be a sea turtle. Kudos to the current management for keeping the natural history museum filled with natural history. I didn’t get back far enough from them to photograph all of the labels, mostly because I had like 90 minutes to jet through roughly 13,792 halls of amazing things. But this one is a loggerhead, Caretta caretta. Identifying the others is left as an exercise for the reader. Or better yet, make your own, if you can procure a dead turtle.